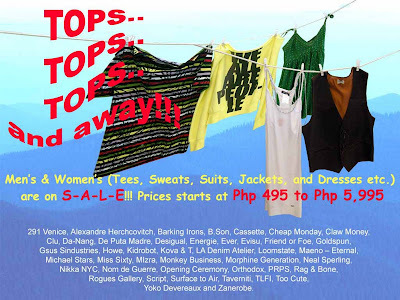 manila fashion observer: Theodore's Tops Sale! Peeps! Theodore's Tops Sale starts Saturday, June 13 until supplies last! When they say "Tops", that means tees, sweats, suits, jackets and even dresses! So I suggest you make your move while there's still plenty of styles to choose from! 291 Venice. Alexandre Herchcovitch. Barking Irons. B.Son, Cassette. Cheap Monday. Claw Money. Clu. De-Nang. De Puta Madre. Desigual. Energie. Ever. Evisu. Friend or Foe. Goldspun. Gsus Sindustries. Howe. Kidrobot. Kova & T. LA Denim Atelier. Loomstsate. Maeno-Eternal. Michael Stars. Miss Sixty. Mizra. Monkey Business. Morphine Generation. Neal Sperling. Nikka NYC. Nom de Guerre. Opening Ceremony. Orthodox. PRPS. Rag & Bone. Rogues Gallery. Script. Surface to Air. Taverniti. TLFI. Too Cute. Yoko Devereaux and Zanerobe.